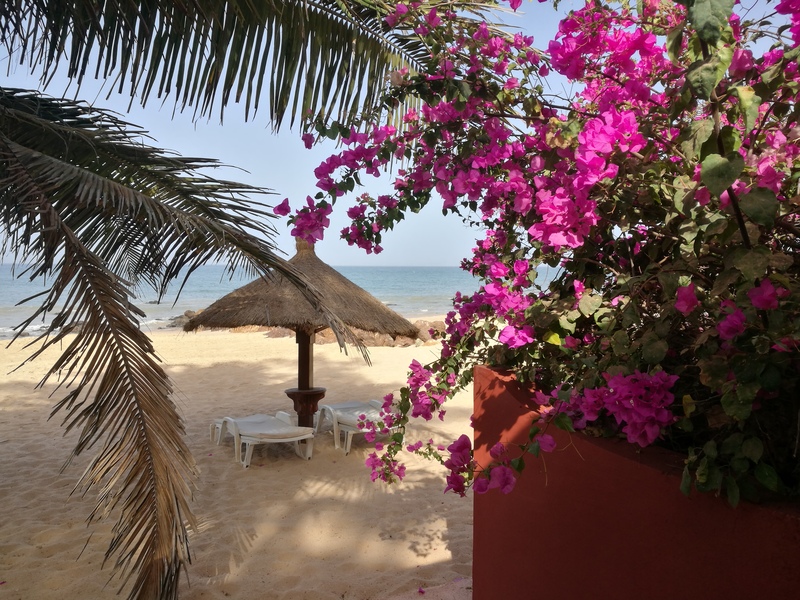 I always enjoy West Africa, the flavors of café touba (spicy local coffee that you can buy and sip on the streets of Senegal), coupled with mango fruit and bounganvilles flowers all around you. The breeze of the ocean and the windy season we are in now. After working in Senegal in 2016, this time I traveled for Love and for Art (whichever the order fits you better). The art bit embraces the Biennale of Contemporary African Art, Dak’Art 2018, which theme reflects upon “Une Nouvelle Humanité” – A New Humanity, creating a new sense of community and human connection. Inspired by the poem “Et les chiens se taisaient” (watch the small video), by Césaire Aimé, the subtitle of the Biennale is “L’Heure Rouge”- The Red hour, an extract from the poet’s play, speaking about emancipation, freedom and responsibility. The Biennale comprises a total of 75 artists from 33 countries of the world, 5 international commissioners, and the extension of the exhibitions , divided into IN and OFF. The INs include all institutional and official buildings ( town hall, theaters, ministries, museums…) whereas the excitement comes when you walk around the city and you see an OFF sign. The OFFs are alternative spaces, id est private homes, hotels, restaurants, public spaces, where the active audience can enjoy all types of visual arts. This use of public spaces, in all neighborhoods of Dakar, is an integral investment of the city in expanding the geographical limits of the Biennale. The OFF spaces multiply the possibilities of rapprochement with the population. The non-institutional spaces highlights the importance of the urban experience in the production, but also in the mediation and in the exposure of the African contemporary art in Dakar. Experiencing la Biennale in its totality means then moving around the city, by bus, on foot, breathing the air of the whole city. The city becomes part of the dialogue with its citizens, who experience arts and culture, where understanding of the artists’ creation is possible only if a dialogue and an encounter are established between artists and population. On the Love bit, i wrote a poem about nature and how we live life (here), not knowing what can happen, but loving profoundly (truly, madly, deeply) and unconditionally. At the end of my reflections, on the wind– which will take us and will make everything stay or disappear (Le vent nous portera), the lesson I learn and I want to share with my Thrive Tribe community is to Never Give Up, but Always Try. “N’abandonnez jamais” in the poem. No matter the result, the important aspect of life is to try, il faut essayer, because experimenting and experiences are better than our wonderful books and studies we do everyday. We can philosophize, theorize, but we can never understand if our skin is left untouched. We need to go and do it. Love and Suffering, the perfect pendulum of life, we wish there was only Love but sometimes there is suffering. And it hurts a lot. In this case, we are not and never alone. A good and close friend is always there for us. Someone we can rely to, someone to lean on, un grande amico ( a true friend), someone who is there for you. The value of Friendship is the highest after family, please read and re-read this post if necessary. When you are suffering or you do not know what to do, it is good to call and get together with a friend, or a group of friends, who can understand you and whom you can count on, sharing your questions and doubts. Experience has also taught me that if you go and your love is not mutual, you can suffer enormously. Therefore, a good trustworthy friend/friends are the family you choose and you can rely on them. It is natural, healthy and good for social emotions. You grow stronger and you listen to some voices outside of you, of people who love you for who you are, and who want you to deserve the best in the world! Amicus est tamquam alter idem (A friend is, as it were, a second self). The musical paragraph of Love is a creation of my mind for you, to take life with a laugh and a philosophical experiential ride into the unknown! I thank my friends Léna & Marion for the emotional support!